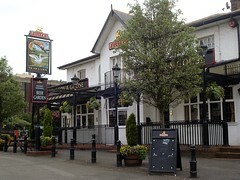 A Fuller's pub and hotel just north of the Hanger Lane gyratory system and attached station. It's quite spacious inside, and divided into a number of different sections with different ambience. A stone-flagged area around the double-sided bar offers high stools for those who prefer to drink at the bar. Elsewhere, the floorboards are covered with matching rugs of various sizes, and the half-panelled walls are split between olive green and cream. Small jars of flowers sit on the tables. Further back is a tucked-away sofa area, and there's a dining area to one side, with tables set with cutlery and wine glasses. There's a rather nice beer garden to the rear, split between lawn and patio, with some seats under cover. There are also a few benches out the front for those who want to watch motor vehicles go by at speed. Kake visited on a Thursday afternoon in April 2011. Four real ales were available, all from Fuller's: London Pride (£1.65/half), ESB, Spring Sprinter, and Royal Wedding. There were quite a few people in when I arrived around 4:30pm, mostly in small groups. Music was playing, generally fairly laid back, and not an overly surprising selection for a hotel bar. According to the Fuller's website as of April 2011, food is served noon-10pm every day. Accessibility: Very steep (but short) ramp to get in at the front, basically a smoothed-over fairly high step. There's a path leading around the side to the beer garden, where the pub can be accessed via a smaller step. It's all level once you're inside, and there's an accessible toilet (marked as "accessible WC and baby change"). Last visited by Kake, April 2011. Opening hours and food times taken from Fuller's website, April 2011. Last edited 2013-05-10 07:11:30 (version 8; diff). List all versions. Page last edited 2013-05-10 07:11:30 (version 8).